These hydraulic breakers are designed for use with backhoe loaders and mini-excavators weighing between 2,200 and 30,850 pounds. 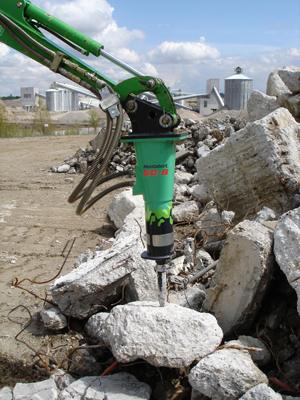 Ideal for lighter demolition applications, Montabert offers eight SC-Series hydraulic breaker models ranging in size from 198 to 1,098 pounds.The light-range hydraulic breakers have few wear parts and no tie rods for simplified routine maintenance. Operators can easily replace the bushing, pins and tools on most SC-Series breakers on the jobsite without removing the breaker from the backhoe or mini-excavator.A fully-enclosed, sound-proof cradle minimizes harmful vibrations, limits jobsite noise and protects working parts from dust and debris..
For more information on Montabert products, visit www.montabert.com.